Sowing date affects pasture establishment, yield and persistence. It is particularly important in summer-dry areas, as sowing early allows individual plants more time to develop and reach over 20 tillers in size, prior to the following (potentially dry) summer. Later sowing in cooler autumn conditions means slower establishment due to the cooler temperatures, and greater potential to pug and damage new pastures in winter and spring. Sowing early (after 25 February) in dry conditions with treated seed is easier for contractors, means faster establishment and more yield, and sets up better pasture persistence. In a recent trial in Cambridge, seed with novel endophyte (NEA2) sown in late February remained in the ground for over 6 weeks without rain. Treatments sowed before the rain maintained a high endophyte level and grew 2 t DM/ha more than seed sown post-rain (5.8 t DM/ha versus 3.8 t) from May to October. At the Forage Value Index value of 38c/kg DM for cool season pasture, that’s $760/ha value added by sowing earlier. The goal is to produce a fine, firm, weed-free seedbed, ideal for plants to establish in. One factor often lacking is consolidation, which conserves moisture and makes it possible to achieve the right sowing depth. Research in the Manawatu showed sowing with a V-roller into a well-consolidated seedbed gave better white clover establishment than a poorly consolidated seedbed. Sow ryegrass and white clover seed mixes at a depth of 5-10 mm to get the best establishment. White clover seed is small and sensitive to depth, and establishes much faster at this depth. Ryegrass is less sensitive to sowing depth, still establishing well when sown at 20 mm. At a depth of 50 mm neither species establishes well. The exception to sowing shallow is in dry conditions, when it is sometimes better to drill seed a little deeper into better soil moisture. In these conditions white clover may struggle. A consolidated seed bed is critical to allow good depth control with a seed drill. In a soft seedbed wheel tracks are pushed down, and coulter depths vary, leading to both uneven seed depth and establishment. There is no ‘correct’ ryegrass seed sowing rate for New Zealand farms. 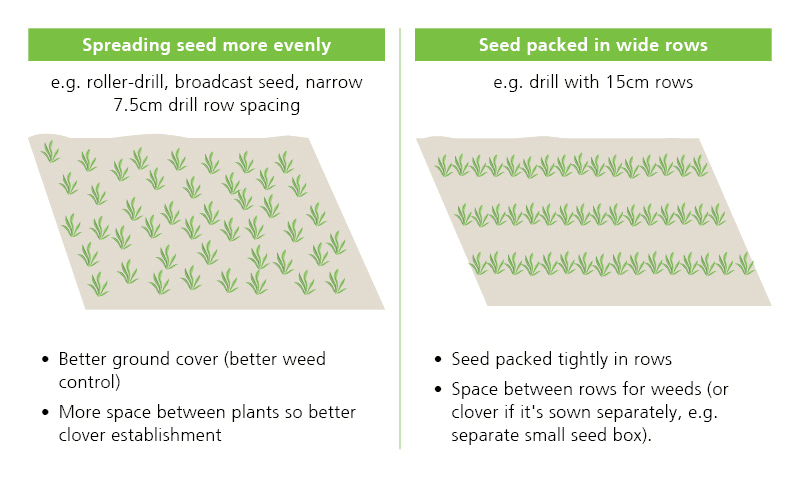 Both a standard and lower perennial ryegrass sowing rate can work well, with the advantages of each outlined below. For further information download What is the 'correct' perennial ryegrass sowing rate. Find out when new pasture is ready to be grazed, when to apply nutrients and how to control weeds.